Electrodes are placed on the patient's chest area to record cardiac electrical activity – e.g. to determine whether the heart rhythm is so irregular that treatment is required; a type of medical examination for which ECG serves well as a diagnostic tool. Not quite so when it comes to examining fetal cardiac electrical activity – for the obvious reason that it is impossible to place electrodes on a fetus's chest area, which makes ECG a no-go in this context. Instead doctors will typically try to get an impression of the cardiac electrical activity by conducting an ultrasound scan; which, however, will not provide precise answers as to what is wrong should the heart e.g. be beating to fast or too slow. In a foreseeable future these problems regarding the examination of fetal cardiac electrical activity are about to be solved – thanks to the joint effort of two groups of scientists from University of Copenhagen: from Quantum Optics (Quantop) at the Niels Bohr Institute (NBI) and from Department of Biomedical Sciences, respectively. In a research paper—which the two groups have just published in the journal Scientific Reports—they describe an experiment which demonstrates that it is indeed possible to get a detailed read-out of fetal cardiac electrical activity. That is, if you ally yourself with a cloud of caesium atoms locked up in a hermetically closed glass cell. "Our next challenge will be to incorporate this technique in a diagnostic sensor – and that is doable", says assistant professor Kasper Jensen, Quantop. Kasper Jensen and Professor Eugene Polzik, head of Quantop, have been in charge of the experiment as far as tests conducted via the locked up caesium atoms go. While Bo Hjorth Bentzen, associate professor at Department of Biomedical Sciences, has coordinated the biological part of the experiment – which includes the use of isolated guinea pig hearts. 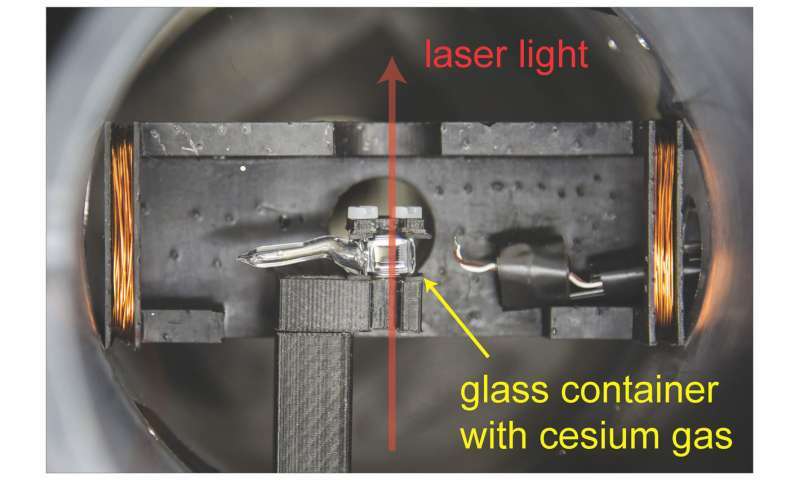 The locked up cloud of caesium atoms is the cornerstone of a technique tailored for observations and measurements which Eugene Polzik and his team at Quantop have refined over a number of years – and applied to a number of tasks. Put simply, the technique allows extremely precise observations and measurements at quantum level –if laser light at certain wavelengths are transmitted through the locked up atom cloud. One project, which Quantop is currently involved in, thus aims at boosting the capacity of gravitational wave detectors through the 'cloud of atoms-principle'. "The locked up caesium atoms are capable of detecting very small magnetic fields. That is the reason why we also started to study this technique as a possible way of measuring fetal cardiac electrical activity – through the pregnant woman's belly. And our experiments demonstrate that this is indeed possible – which we also conclude in our article in Scientific Reports", says Kasper Jensen. In order to conduct the experiments, the Quantop-scientists needed hearts which they could measure – and these hearts were provided by associate professor Bo Hjorth Bentzen and his team at Department of Biomedical Sciences. "Guinea pigs have a heart rhythm fairly close to that of a human fetus – and a number of the proteins which regulate heart functions in guinea pigs resemble the corresponding proteins in humans". During the experiment the scientists at Department of Biomedical Sciences euthanized a total of six guinea pigs – in accordance with protocols approved by the Danish Veterinary and Food Administration. The hearts were surgically removed from the animals, cooled down – and then transported to the Quantop-lab at NBI just a few hundred meters away. At Quantop the hearts were gradually warmed up to body temperature – and subsequently placed in a Plexiglas chamber with a constant supply of oxygen and water in the form of a salty solution. This environment made the guinea pig hearts start beating – which they would typically do for the next three to four hours. The equipment was placed behind a magnetic shield in order to keep all outside electromagnetic activity away – and while the heart was beating, the scientists measured the electrical activity from the organ through the Plexiglas wall. By measuring in this fashion – at a distance of approximately one centimeter and without attaching electrodes to the heart – the Quantop-scientists mimicked a situation where fetal cardiac electrical activity is recorded via an instrument placed directly on top of the pregnant woman's belly. 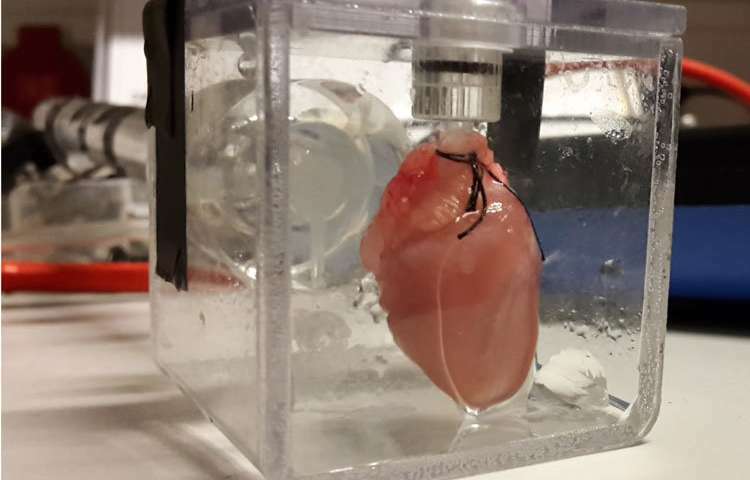 In order to show that the equipment is capable of detecting electrical signals stemming from heart problems, the team of scientist from Department of Biomedical Sciences added a chemical to the salty solution that was continuously pumped into the Plexiglas chamber. This chemical changes the electrical signal in the heart – (triggering a reaction similar to what is seen in association with long QT syndrome, a hereditary heart condition) – which the system was also fully able to detect. "Such equipment could make a difference in relation to e.g. AV-block – a rare condition which blocks certain electrical pulses in the heart. AV-block can develop in a fetus if the mother suffers from lupus or Sjogren's disease – and if doctors suspect that a fetus is developing AV-block, they will start treating the mother medically in an attempt to protect the fetus. However, at present we only have one option when it comes to evaluate how severely damaged a fetus's heart conduction system actually is – namely doing an ultrasound scan. This method is encumbered with uncertainty – which is not the case when you conduct a direct measurement of fetal cardiac electrical activity", says Dr. Vejlstrup. Rigshospitalet is keen on participating in clinical trials in order to develop the new method, says Niels Vejlstrup – adding that the method will be equally beneficial when it comes to diagnosing all other types of fetal heart rhythm disturbances. Around the world groups of scientists are developing advanced measuring-systems – in some cases based on superconductors or on the use of rubidium, a chemical element. These methods, however, require extreme temperatures – close to absolute zero at -273.15 C, or in the vicinity of +200 C.
"In both cases the temperature bars the technique from 'just' being incorporated in equipment designed to detect e.g. fetal heart rhythm. Our equipment, on the other hand, operates at room temperature – which is an advantage in this context. We estimate that within three years doctors can start using our equipment to measure fetal cardiac electrical activity", says Kasper Jensen.